You never have to fight with a spouse or sibling again whenever both of you wants to use the same USB device at the same time. Thanks to wireless network storage, anyone in your household can use the same USB-enabled drive at the same time inside the house. All you need is the new LaCie LaPlug! This new hi-tech device is jampacked with some awesome features you surely wouldn’t want to miss. LaPlug is a wireless network storage that lets you or family and friends access data at home or while on the go. You can insert your USB flash drive, USB hard drive or printer into the LaPlug. You can even share your USB printer wirelessly so anyone inside your home, whether inside different rooms and floors, can have access files from a computer, TV or gaming console. Yes, it supports a Wi-Fi connection, and maybe even goes a step further. With the LaCie LaPlug, your USB flash drive is not solely accessible within a specific radius. Instead of emailing tons of files from your USB, you and network users can access them from LaPlug. All they need is an Internet connection. One fun feature of LaPlug is multimedia streaming. 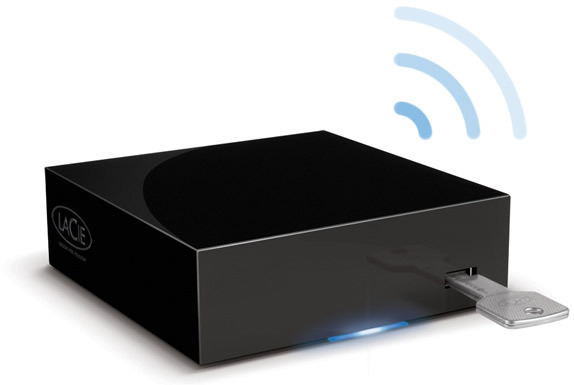 With LaPlug, you can easily access any equipment that’s UPnPTM/DLNA-certified (yes, like your PS3 and Xbox 360), such as the LaCie LaCinema Classic HD, or watch a movie or listen to songs that are saved in your USB key by just accessing the network. Finally, the wireless network storage can automatically back up all your family’s computer data and make itself available as a hub location for these devices through the backup software included or through Time Machine. LaPlug initiates the backup and does this as soon as the PC is connected to the local network so there really is no need for any click here, click there action. Now, if only LaCie could tell us more about transfer speeds and the number of people who can access through the LaPlug at the same time without having to worry about slow loading, then I’d be even more sold. Anyway, if you’re planning to get one, the LaCie LaPlug is available through the LaCie Online Store, LaCie Program+ and LaCie Program+ Reseller at $74.99. This entry was posted in Articles, External Hard Drive, LaCie, LaCie LaPlug, USB Devices, USB File Sharing, USB Flash Drives, USB Future, USB Gadgets, USB Technology, Wireless USB Hub and tagged LaCie LaPlug, LaCie LaPlug Turns USB Drives into Cloud Storage, LaCie LaPlug USB Wireless Network Device, Lacie LaPlug Will Turn Your Hard Drive into a NAS, LaPlug, Share Data Wirelessly with LaPlug by LaCie, USB Flash Drive, USB Hard Drive, USB printer, USB-enabled drive, wireless network storage. Bookmark the permalink.